Cragar S/S Super Sport wheels feature timeless styling. Cragar wheels have been around for decades and still raise eyebrows after all these years. 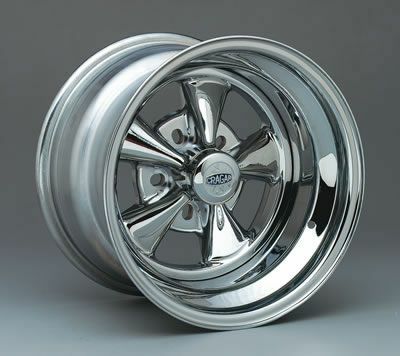 The S/S Super Sport wheels from Cragar have the same classic 5-spoke design (except for 4-lug models) and mirror chrome finish that made them so popular. They feature composite construction consisting of a steel rim mated to an aluminum center. The wheels include the same stylish chrome center cap, and use mag-style lug nuts and washers for mounting. Cragar offers a variety of sizes, including larger-diameter models for today's high performance tires and suspensions. The wheels are available in both standard and reverse offset models to fit nearly any combination. Reverse offset wheels have less backspacing and more dish, which may interfere with some brake and wheel opening configurations. Kundenbewertungen für "1964-73 Cragar S/S Felge 15x7 (Stahl - Chrom)"